According to Apartment Therapy, a walnut can be as beneficial as refinishing furniture—plus it's cheaper, easier, and more efficient. As the nuts wear down, they fill in the light dents and color the wood brown once again. If you don't have a walnut handy, HowCast also suggest trying a few other varieties of nuts that work well. Pecans, almonds, and Brazil nuts can do the same job, if you have them handy, though walnuts are the softest and easiest to work with. The walnut method really makes a difference, as YouTube user HervorandWayland shows on their own very scratched chair. Although it looks like the entire chair may need to be refinished, a walnut removed years of damage in a short time. Of course, if your furniture suffers from very deep dents and marks, a simple nut may not be enough to reverse the damage. Walnuts and other nut varieties are best used on similarly-colored pieces, as Green Idea Reviews points out; darker woods, like cherry, aren't close enough in color to benefit. 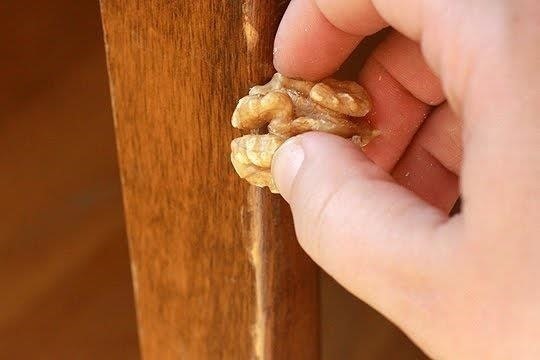 Before you begin rubbing raw walnuts and other types of nuts all over your furniture, double check its finish and material. If you've purchased any pieces from a retailer known to apply any kind of lacquer finish, such as IKEA's wonderfully polished pieces, the walnut technique won't work very well. The nuts work to both fill in the indents created by damage and match the coloring of the original wood—and if your wood coffee table is slick, shiny, and bright blue, chances are a walnut won't help at all. Instead, you'll want to consider sanding away the lacquer and repainting or refinishing the piece. Natural wood is best when covering damage with nuts. So if you need a quick DIY repair for your wooden bed frame, grab a few nuts and start "coloring" those scratches in!